It’s always so great when, just sometimes, you are in the right place at the right time. 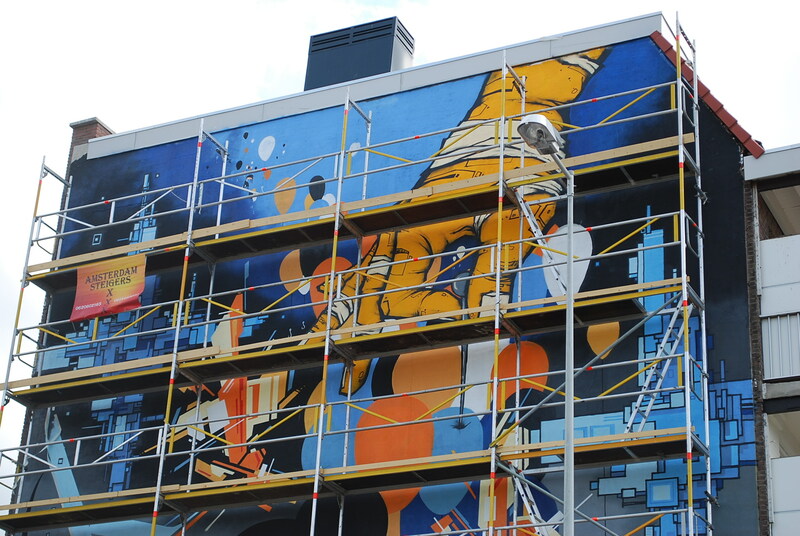 I experienced a little bit of that when I was in Amsterdam in June this year, which is when several artists got together to paint a huge piece known as the Mikosa Mural. 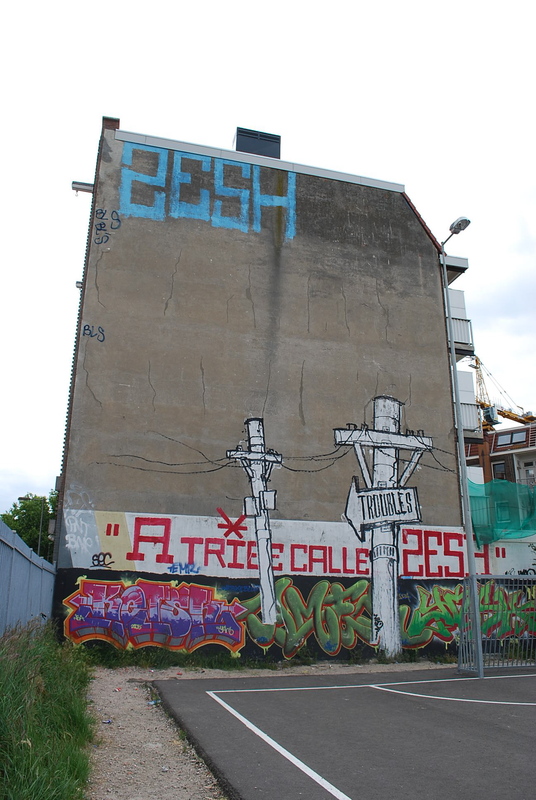 Amsterdam is a small city with a long tradition of graffiti and street art, thanks to the radical politics of squatters and others throughout the last few decades. But in recent years the city has become more conservative. Although the red light district and the coffee shops are flourishing (and as such Amsterdam seems to be a liberal, progressive, hip city) political shifts have taken place which mean that there are tensions within the city about ethnic differences, about ‘anti-social behaviour’, and so on. In such a climate, getting sponsorship for a gigantic graffiti mural to showcase the work of several artists is quite a feat. 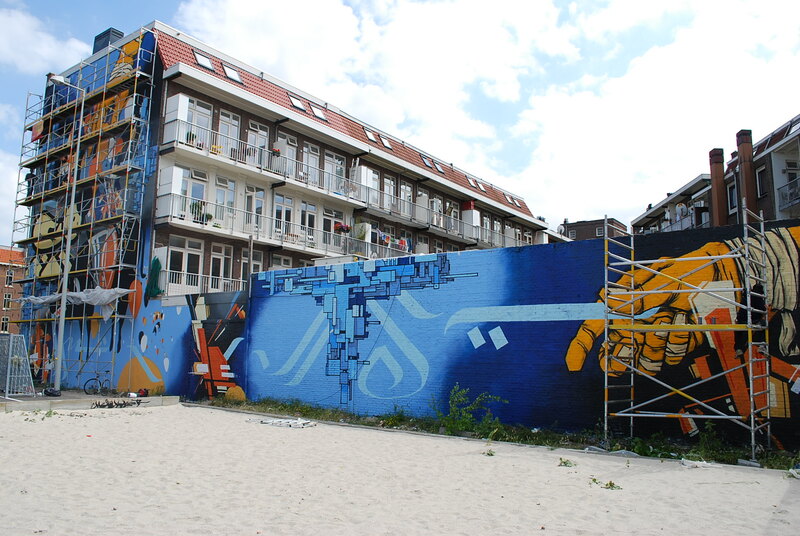 The ‘Mikosa Mural’ was created through the efforts of the Mikosa Foundation, founded in Amsterdam in 2005 by Marco Galmacci, Rocco Pezzella, Claudius Gebele and Henk Kramer. Check it out HERE. Mikosa supports the work of artists ranging from graffiti writers through street artists, internet designers, and video artists.It organises exhibitions, has a clothing range, and produces a ‘magazine’, which as a term just doesn’t do justice to their extremely cool and classy publication. 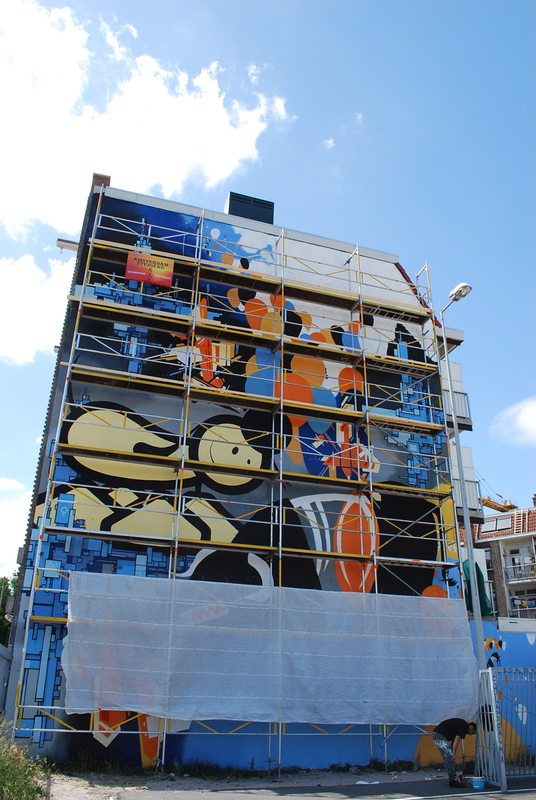 But the Mikosa Mural was something different – a much bigger project than before, involving a lot of sponsorship – that is, basically schmoozing not only to get the funds to pay for a ton of paint and scaffolding, but also to get permission to undertake the project in the first place. Painting the wall would take ten days. Its height meant that six levels of scaffolding were required (one of the things that Mikosa had to organise was insurance for the artists working on the scaffolding). 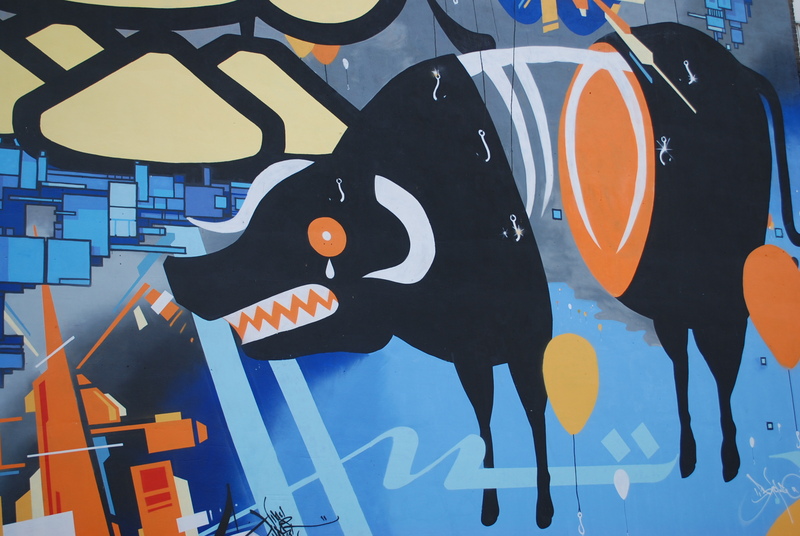 The artists taking part were Zedz, Lordh, The Boghe, Morcky, Wayne Horse, and The London Police. 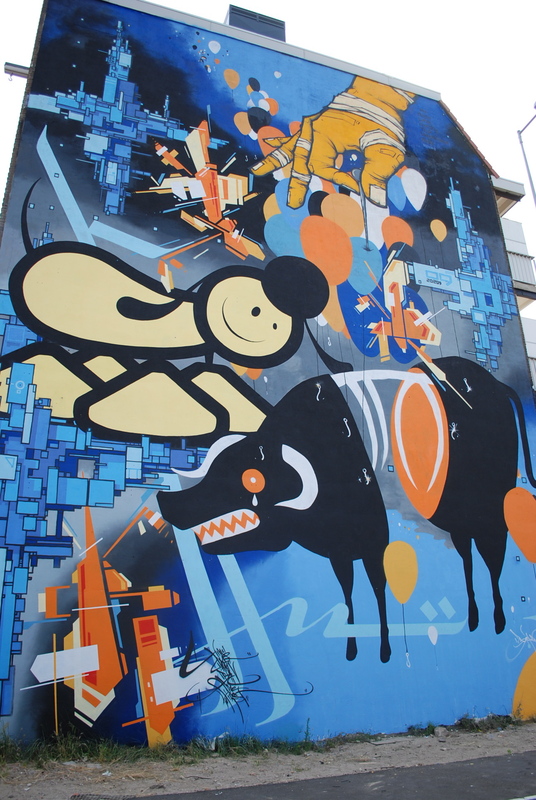 Some had been featured in a 2006 exhibition at GEM, the Museum of Contemporary Art in The Hague, which was the first street art show in a contemporary art museum in Holland. All of them are amazing, and very different, artists. For me, the timing was so good because I got to observe the mural as it took shape. I turned up at the site several times during the ten days, and watched the artists paint, and paint. And on one day, I turned up to discover them repairing the images, which had been heavily tagged during the night (the scaffolding of course made it easy for anyone passing to climb up and tag over the work). While something like this on the one hand is part and parcel of graffiti, on the other hand there were a couple of things that made it seem so frustrating. First, the mural was clearly the work of artists at the top of their game, and tagging over it just seemed so… so… disrespectful. And second, the guys who had bombed the mural had stopped by the site during the day before to chat to the artists and in fact came back the day after the tagging to say: ‘nothing personal, it’s just graffiti’…. But it seemed to feel pretty personal to the artists who were now forced to repaint their work. And here’s what the mural looked like when it was finished. Fantastic!